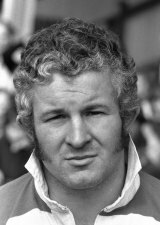 Welsh-born Prop Phil Blakeway made his Gloucester debut in 1971 but had to wait nine years for England recognition, and that came two years after he almost quit after breaking his neck. As it was, his career was dogged by injury problems but he still made 19 appearances for his country and was part of the side that secured the Grand Slam in 1980. But thereafter the side declined and although he played in all Five Nations matches in 1985 he retired at the end of the season to return full-time to the family fruit and vegetable wholesalers.